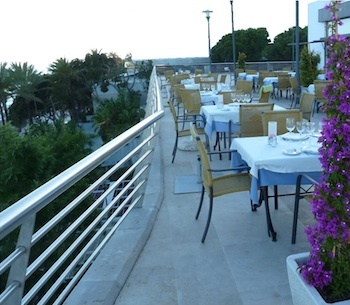 Overlooking the Med, high above the paseo maritimo, La Navilla is an idyllic setting for the fine dining experience that the brothers Miguel and Manuel Pedraza have created. menu combining many traditional dishes, albeit with his own twist, as well as several interesting, and innovative dishes, some at the request of his clients. One such starter is of small fillets of Sole with bananas grilled and served with a delightful sauce. The professionalism and bon ami shows through with Miguel, the Maitre-D, who certainly seeks to please, as when it became a little chilly on the terrace, they were only too pleased to moved us, lock stock and barrel into the main dining room. I would guess that the terrace would seat 200 and main room could easily take 80 diners, and as is the trend at the moment, one can see all that is going on in the kitchen. 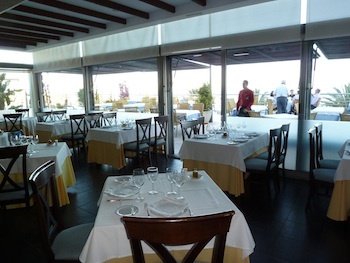 Next time I will try the Rabo de Toro a la Cordobesa, one of the chef’s specialties. On their web site www.alnavilla.com you will find the Menu, Achievements and History of the brothers, Photo gallery, Cava list (but no wine list) and much more, but there is no English option. Saturday - During July and August they are open 7 days a week. 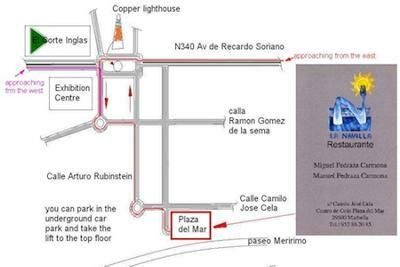 There is a car park below Plaza del Mar. See ‘How to get there’ map.